The Sawfish has been around for a couple years now, but we took notice after spotting it at Greenbuild two weeks ago. The timber provided by this robotic logger received accolades as one of Building Green’s Top 10 Green Building Products, which were announced during the conference. The Sawfish is a remotely operated lumberjack vehicle, developed to harvest timber from underwater standing trees. Triton Logging Inc. estimates that there is over 5 billion linear board feet of usable timber submerged in the forests of British Columbia’s lakes and reservoirs – and that’s less than 5% of the potentially viable timber worldwide! The technique utilized by the Sawfish has been carefully assessed by the Rainforest Alliance and has been certified by the Smart Woods Rediscovered program. Engineered to tread (or swim) lightly, it measures a mere 6’x6’x12′, and weighs in at 7700lbs. Floats are tethered to the trees so that once felled, no sediment is disturbed. The Sawfish is equipped with a 55″ electric chainsaw, 8 on board video cameras, and uses biodegradable vegetable oil for its hydraulic system! I think one very important question to ask oneself is if the man or woman behind a project like this has any concern for things such as the environment in this situation. If their compassion and moral self responsibility outweighs their ambition and greed then I would assume that a project like this would be undertaken with moderation and care. Personally, I really don't think these guys are out to burn down the world and leave a scourge upon the countryside in their persuit for wealth. I think they had a family to support and an innovative way to go about doing it. I guess we will see in the end thow right, either way, I think there are much more important issues to get upset over. People don't see it for what it is. The only reason the cosystems are even there is because of a manmade structure to start with. There is no good reason not to harvest this lumber. It would be a waste to leave it, because of exactly what is said in the artiucle. The demand for lumber is going to be the same so for every tree that comes from the water saves one potentially on dry land. I have to wonder if intelligent logging practices are being used along with this aquatic lumberjack. I imagine that stripping the bottom of a lake would have negative impacts for water based wildlife that are similar to those experienced by land based wildlife when a forest is stripped. Don’t get me wrong, this is an interesting idea, but like anything that alters the landscape it has to be done in moderation. I'm from BC, I have personally planted over 350000 trees in the course of a 7 year career as a treeplanter hired to "reforest" clearcuts after logging. As such I have a pretty intimate knowledge of terrestrial logging practices and their effects....and it ain't pretty. If anything can be done to slow the harvesting of trees on dry land I'm for it. There are obviously alot of questions regarding this "new" resource (like why are these old growth trees underwater anyway? hydroelectric dams.....supposedly more green than coalburing and nuclear powerplants....?). But, generally, I think harvesting them is a better use of resources than leaving them there and impacts the ecology FAR less than terrestrially logging. Seeing as the trees in question are already dead, I don't see why anyone should be appalled. The sawfish seems like a neato thing! More or less enviromentally safe and efficient. It wouldn't change the world as we know it but it'd nice in BC 'specially with pine beetle and whatnot. THIS COMMENT IS FOR IGOR what is the structure you spend time in built of....... wood so stop crying. Upon reading this article my first thought was "oh, just great, cut down trees that are even underwater...will it ever end?" Then I started reading the comments, and my mind started flip flipping back and forth, oh this isn't so bad, well, yes it is, no it's not....you get the idea. Frankly, I wonder how "safe" it would be to say, build homes using lumber that is contaminated with heavy metals...sounds like the lead paint problems of the past, not to mention, wouldn't it be better to not spread it around, and stir everything up? I don't know the answers, but something just troubles me about it. A few clarifications on some really good points being made… But first, full disclosure: I am part of the Triton team, a fact which I hope you will view as a positive (at least in terms of underwater logging knowledge). Ecosystems – When we harvest, we leave areas for small fish protection & bird nesting (in the case of protruding trees) & often repatriate branches to create artificial reefs. With fewer trees, reservoirs/lakes "breathe" better & have less turbidity. Sustainability – Andrew is right: Underwater forests are not renewable. However, with 300 million trees submerged worldwide, this is not an insignificant way by which to alleviate stresses on virgin/living forests – for centuries to come. We believe that by having reliable, economical access to a clear eco-wood source, consumers will have heightened enviromental expectations for all wood products – which cannot be a bad thing. 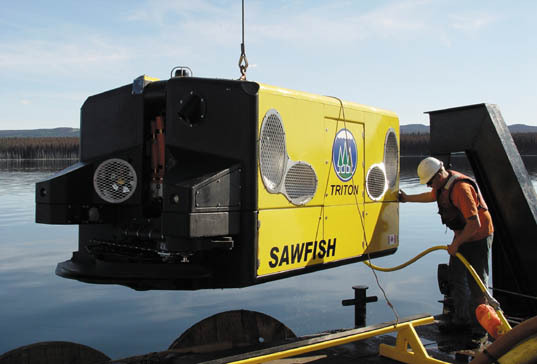 Certification – Triton is certified by the Rainforest Alliance which has very stringent rules for underwater logging/salvage operations. Everything from fuel use to how we work with First Nations is assessed. In many jurisdictions, our system is becoming the standard by which others are assessed and certified, meaning fewer divers get killed and less habitat is destroyed. Heavy Metals – Big issue, for sure. But only if the sediment at the bottom of a reservoir is disturbed. Because the Sawfish hovers above the lakebed, & because it leaves the root ball intact, there is little to no turbidity. Some other facts: Thousands of people, mostly in the developing world, are killed each year when boats hit submerged trees. The Sawfish marks each cut tree with GPS coordinates & can then map safe routes for travel. Triton wood products do not cost “three times as much” as regular wood. If there is a premium, it’s usually in the 10-15% range – or priced just the same. To learn more, watch for Triton this weekend on CNBC’s one-hour special “Mike on the Money” (Dec 3 @ 9 PM ET) & an upcoming feature article in the Feb. issue of WIRED magazine. Thanks for the interest. Happy to talk offline if you have more questions. Reach me through www.tritonlogging.com. I don't know about BC but in Quebec the water in the reservoirs is already toxic, it's laden with heavy metals from the rains. I think it's a great idea - as long as it's cost-effective, it seems like a win-win situation. Of course, there are several potential draw-backs that need to be examined - as mentioned above, the effects on the underwater ecosystem, the fact that these trees are a non-renewable resource, and so on. I think the underwater logging industry should obtain a certification system to guarantee the prevention or mitigation of environmental impacts of this technology. Wouldn't the denizens of those bodies of water be affected by such a ravaging of their ecosystem? For surely those trees have become part of it, dead or not. The Sawfish has been around for a couple years now, but we took notice after spotting it at Greenbuild two weeks ago. The timber provided by this robotic logger received accolades as one of Building Green's Top 10 Green Building Products, which were announced during the conference. The Sawfish is a remotely operated lumberjack vehicle, developed to harvest timber from underwater standing trees. Triton Logging Inc. estimates that there is over 5 billion linear board feet of usable timber submerged in the forests of British Columbia's lakes and reservoirs - and that's less than 5% of the potentially viable timber worldwide!